The foyer with a barrel vaulted ceiling makes a great first impression. Keep going and step down into the sunken family/living room, the hub of family activity. A large fireplace occupies the right wall, adding coziness to the room, while the rear window wall adds illumination. Counter space defines the kitchen, while a decorative ceiling tops the dining room. The split-bedroom design offers privacy for all and if you don’t need the third bedroom, it can be easily converted into a study. 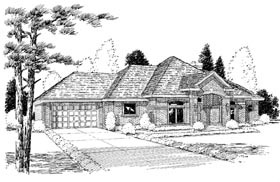 This home is designed with basement, slab, and crawlspace foundation options.